While the ELV debate from yesterday's posting rages on, it's probably a good time to show something completely different, this time in the form of a great try from the past. While many people wouldn't normally associate former England captain Martin Johnson with his running ability, this try is refreshingly good for a man who is over two meters tall and weighed close to 120kg's back then. The try comes from the Zurich Premiership, as it was known at the time, and is against Harlequins in what we think can only be the 2001/2002 season. 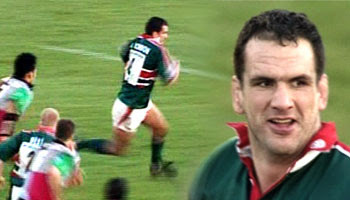 It was a highly successful period in Leicester rugby history, with the club winning both the Zurich Premiership and the Heineken Cup in 2002. Leicester's longest ever serving captain then led England to victory with the Grand Slam the following year, followed by the World Cup win in Australia. He was a hard man who's style of play was uncompromising, but he was highly respected and his leadership was such that many name him as one of the greatest captains of all. He is currently at the helm of English rugby, and hoping to turn their fortunes around and achieve greatness once again, this time in the coaching role. After all the plaudits, I think it's safe to say that what we see in this short clip certainly wasn't what people would have expected him to be capable of. I'm not sure if such a big man can actually sidestep, or more specifically, if this can be classified as one. It was probably more of a change of direction. But it was a helluva good finish whatever it was, because it resulted in five points for Leicester and bragging rights for the big man. If the backs won't do it, get in there and show them how it's done. The first step was actually better. Coming inside to take the pop. What a genius. Yeah, looks that way. Fair enough Edd. Cheers for that. Haha nice try. Never seen that before. Who knew the big guy could move like that. I think he surprised himself judging by the big laugh afterwards! He scored a good try against Munster in 2003 I think, the day he announced his international retirement, where he ran in from the 10 meter line. When he got a bit of room (not v often - hence the surprised look!) he could actually shift at a fair rate - perhaps because he covered about a third of the pitch with every stride. This is quality though, nice change of direction and pace for the try! He was a great captain for England...lets hope they do better under his management maybe Rob Andrew needs to be axed...I dunno...he's a dinosaur...??? Fantastic sidestep, for a forward that is. Great try. England to win the World Cup in NZ2011 with Johnson at the helm!! It was actually after the world cup because he played another season after internatonal retirement. one of the greatest players to wear the red rose and to lead any side onto any field in any era. Great try for such a big man. "All Blacks end All Black home winning streak in Dunedin"
Well spotted bD. Shoot me a mail in future rather though, as I don't always manage to check the comments. Thanks though. Too many late nights for me. Gotta feel bad for the last man there! even if he hadnt fallen for the dummy it would have been like tackling a herd of bulls! martin-offload, nah, compare the kit worn in 02 with the kit worn in this vid and it's the same. The 04-05 kit was completely different.